Why can't a rope be pulled completely straight? I have found several discussions on how to calculate the sag of rope that is tied off at two points (like a tightrope), and I understand it to a certain extent. What I can't wrap my head around is how come it is impossible to pull the rope tight enough that the sag goes away completely? I'm talking about big thick ropes, like a tightrope that has to be strong enough to hold at least one person. I can pull a piece of string so that it's perfectly straight...does this just have to do with scale? I like physics, but I'm not great at it, so if someone could answer this in as close to layman's terms as possible, that would be greatly appreciated. In mechanical equilibrium, things go to their lowest energy state. Whenever you've minimized something, it means that small deviations don't change its value (to first order). 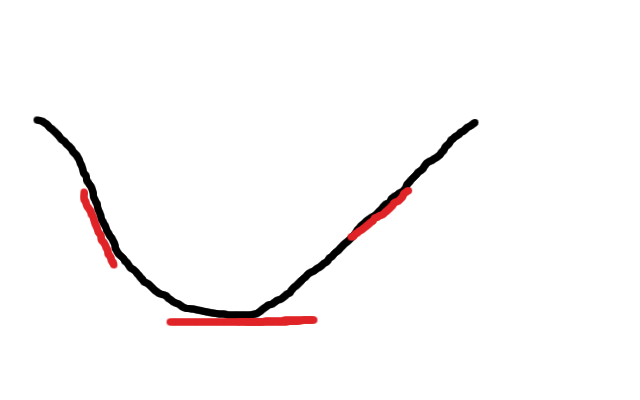 At the bottom, it's flat, which the middle red line shows. When you look on the sides away from the bottom, it's sloped. So if you want to be at the bottom, you need to be somewhere where small steps in any direction don't change your height. When you minimize a quantity, small deviations don't change it. The black things are pulleys on supports. The brown thing is a rope. The grey things are weights. 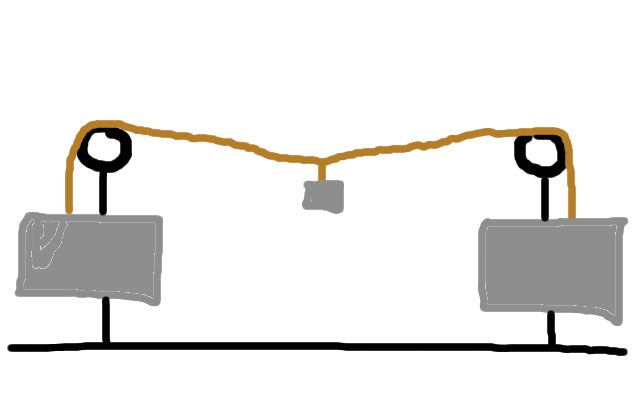 How heavy do the weights on the sides have to be to pull the rope straight? There's a tradeoff here in terms of energy. You could pull the middle weight down further, lowering its energy, but that would yank the end weights up some, raising their energy. The system will have to find the right angle of the ropes so that the energy is minimized. A straight string will never minimize the energy, though. It's the shortest possible path between the two supports. Since it's the shortest path, small deviations to that path don't change its length to first order. (That's the math point from the beginning of the answer.) That means that you could always lower the energy a little bit moving the middle weight down. The side weights don't go up because the distance between the middle weight and the posts isn't changing. Meanwhile, the middle weight is going lower down, so the total energy of the system goes down. That means the straight line is never the lowest energy state, and so can't be the equilibrium configuration. The diagram above shows an idealised rope with all it's weight concentrated at the centre of the rope. If the rope mass is $m$ then the force downwards is just $mg$, where $g$ is the acceleration due to gravity. and you can now see why it's impossible to pull the rope straight. As you pull the rope straighter $\theta$ becomes smaller, and for the rope to be completely straight $\theta$ would have to go to zero. But the force is proportional to 1/$\theta$ so to get the rope straight the force would have to be infinite. For light ropes/strings the force $mg$ is very small, so we can eaily pull the string straight enough that by eye we can't see the sag. The sag is still there but it's to small to see. With a heavier rope $mg$ is greater and we simply can't put enough force in to make the sag too small to see. You can't pull a piece of string perfectly straight - you just can't see the sag. Mathematically - As you pull tighter the sag gets less, but it's a function of 1/force, so to get zero sag you need infinite force. Physically the force is only applied sideways, as the particle of string gets less sagged the vertical effect of the sideways force gets less so if it was infinitesimally just below straight the force would have infinitely small effect and so there would be nothing to pull it up into perfectly straight. You will not be able to make a string completely straight in the influence of gravity as you earlier thought, because any string/rope has its own weight and that leads to sagging of the rope. Usually in high school education this fact is not pressed upon, by considering an ideal string/rope (that doesn't have mass at all). When you sit down to do mechanics with a massive string, then you need to account for the mass of the string as well. What one does is in that case at a point he takes a infinitesimal segment of string having mass $dm = \mu.dl$ and equates force in horizontal and vertical directions. Well, if the string was pulled such that it was along a radial arm from the centre of the "earth", in other words, in a vertical, then it wouldn't sag. Any deviation such that it is no longer exactly vertical, then the above answers come into play. I know this isn't what you are really asking, but let's admit, it does apply to the question as stated. Not the answer you're looking for? Browse other questions tagged newtonian-mechanics newtonian-gravity statics free-body-diagram string or ask your own question. Why won't a tight cable ever be fully straight? What happens to bodies that lift each other up? Why is tension constant in a massless rope?